Why is the Mainstream Media Ignoring the Rabid Anti-Semitism of the New Ukraine Government? The anti-Semitism of many of the “reformers” that have seized power in Kiev does not fit with the narrative that the U.S. government is trying to push, so the mainstream media conveniently turns a blind eye to the fact that the United States is essentially helping neo-Nazis take power. 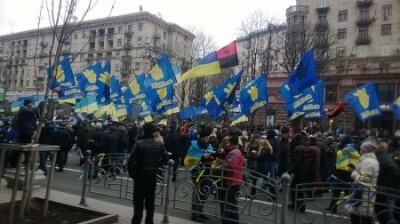 In fact, leaders of the Svoboda Party have been appointed to numerous important positions throughout the new government. As you will read about below, the head of the Svoboda Party has denounced the “criminal activities” of “organized Jewry”, another top Svoboda official regularly quotes Joseph Goebbels, and the Party itself was known as “the Social-National Party” (in reference to National Socialists) until 2004. There is a long history of anti-Semitism in Ukraine, but our politicians in Washington D.C. don’t seem to care about that. All they seem to care about is making sure that there is not a pro-Russian government in Ukraine no matter what the cost.